ANCHORAGE—Alaska’s independent Gov. 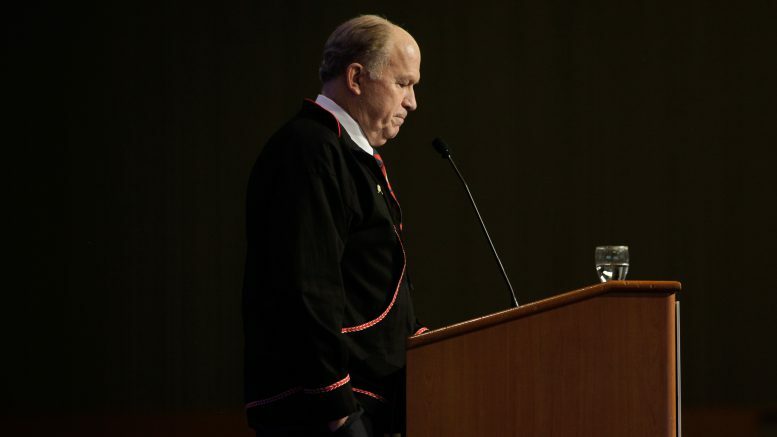 Bill Walker closed his annual remarks to the annual convention of the Alaska Federation of Natives with a heartfelt apology to Alaska Natives for the generational trauma brought on them by the state of Alaska. Walker’s administration has been marked by its efforts to repair and improve the historically fraught relationship between the state government and Alaska Natives, including resolution of many lawsuits as well as landmark agreements to expand the authority of Alaska Native organizations and groups in the realms of health care, child care and crime. The remarks were well-received by the audience, but ultimately seemed to be shadowed by the appointment of Lt. Gov. Valerie Davidson, an Alaska Native woman who had formerly headed the Department of Health and Social Services, earlier this week after the shocking resignation of now-former Lt. Gov. Byron Mallott. 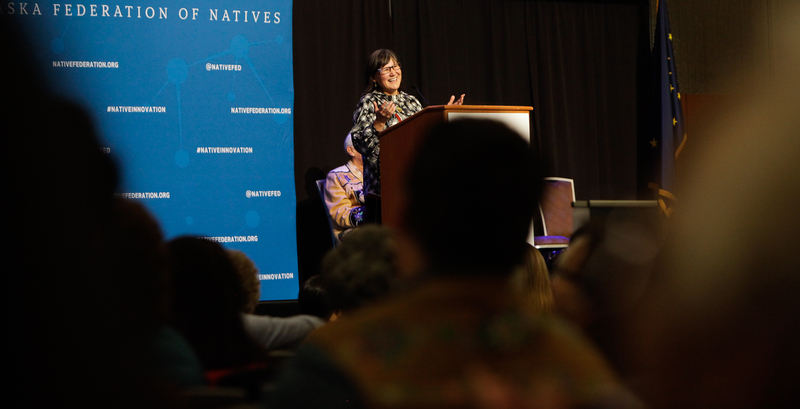 Davidson had been scheduled to deliver the opening keynote of the convention as a commissioner, but instead took the stage today as the first-ever Alaska Native woman to hold statewide office. She was met with a raucous standing ovation from the audience. Lt. Gov. 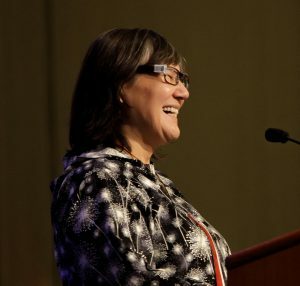 Valerie Davidson delivers the keynote address at the annual convention of the Alaska Federation of Natives in Anchorage on Oct. 18, 2018. Much of Davidson’s keynote was spent genuinely connecting with the audience and telling personal stories, proving just why the woman with tape holding her eyeglasses together has become one of the most beloved members of the Walker administration. She addressed the Mallott’s resignation—the surrounding details of which are still largely unknown—and said it shouldn’t diminish the work of the administration and the progress that it’s made in its four years. Davidson was also not shy about talking about her own personal experience as an Alaska Native woman, telling the audience that she scores a nine out of 10 on the Adverse Childhood Experiences scale. Her message to the women in the audience was one of hope. Though Mallott’s name will remain on the ballot, Davidson has assumed a role in the campaign and will take office if the Walker ticket prevails on Nov. 6. Though there’s been significant pressure for Walker to withdraw from the race entirely, it’s hard to overlook the boost that Davidson gives to the troubled campaign. There’s been plenty to criticize about the Walker administration’s handling of Mallott’s resignation, but the confident appointment of Valerie Nurr’araaluk Davidson is certainly not one of them. Be the first to comment on "Gov. Walker to AFN: ‘I apologize to you, Alaska’s first people, for the wrongs that you have endured.’"